February 23, 2015 – Sometimes at Saturn you can see things almost as if from every angle at once, the way a Cubist might imagine things. For example, in this image, we’re seeing Saturn’s A ring in the lower part of the image and the limb of Saturn in the upper. In addition, the rings cast their shadows onto the portion of the planet imaged here, creating alternating patterns of light and dark. This pattern is visible even through the A ring, which, unlike the core of the nearby B ring, is not completely opaque. The ring shadows on Saturn often appear to cross the surface at confusing angles in close-ups like this one. 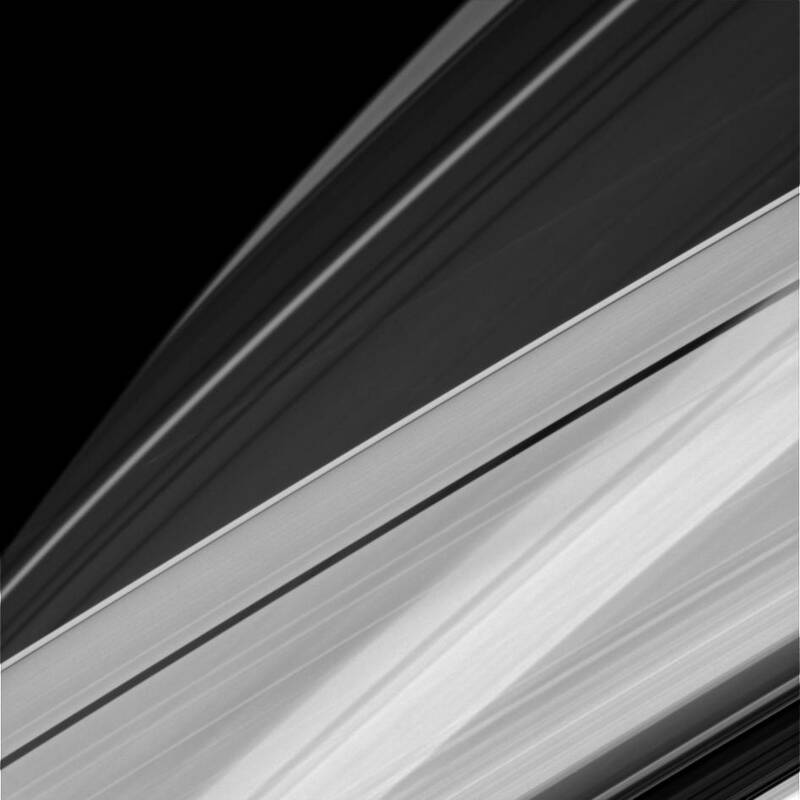 The visual combination of Saturn’s oblateness, the varying opacity of its rings and the shadows cast by those rings sometimes creates elaborate and complicated patterns from Cassini’s perspective. This view looks toward the sunlit side of the rings from about 19 degrees above the ringplane. The image was taken in visible light with the Cassini spacecraft narrow-angle camera on December 5, 2014. The view was obtained at a distance of approximately 1.2 million miles (2 million kilometers) from Saturn. Image scale is 7 miles (11 kilometers) per pixel. The Cassini mission is a cooperative project of NASA, the European Space Agency and the Italian Space Agency. The Jet Propulsion Laboratory, a division of the California Institute of Technology in Pasadena, manages the mission for NASA’s Science Mission Directorate, Washington, D.C. The Cassini orbiter and its two onboard cameras were designed, developed and assembled at JPL. The imaging operations center is based at the Space Science Institute in Boulder, Colorado.